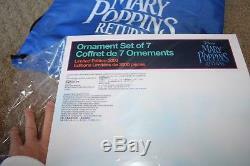 Celebrate the return of Mary Poppins with this beautifully presented set of hanging ornaments. 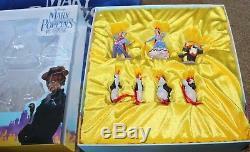 Limited to 3000 worldwide, it includes intricately detailed character's from the film's animated sequence, complete with characterful penguins. 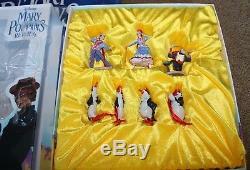 Set of 7 hand-painted hanging ornaments. 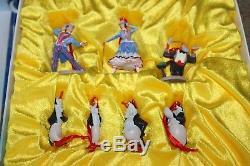 Figurine character's include: Mary Poppins, Jack, 1 orangutan and 4 penguins. Satin ribbon hanging loop attached to the top of each ornament. Presented in a pull-out coffret with yellow velvet covering the casing. Product H8.5 x W6 x D4.5cm approx. Packaging: H28.5 x W26.3 x D7cm approx. Please note: these are decorative items, not toys. 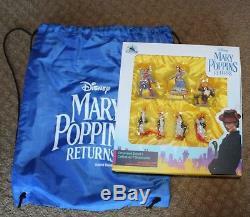 The item "DISNEY MARY POPPINS RETURNS PROMO LIMITED EDITION HOLIDAY ORNAMENTS SET OF 7 BAG" is in sale since Sunday, December 2, 2018. 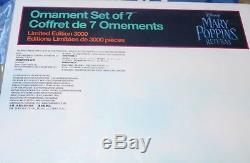 This item is in the category "Entertainment Memorabilia\Movie Memorabilia\Merchandise & Promotional\Other Movie Promo Merchandise". 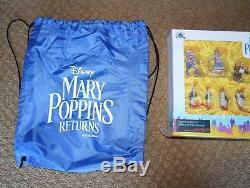 The seller is "movieheaven1968" and is located in Canoga Park, California. This item can be shipped worldwide.